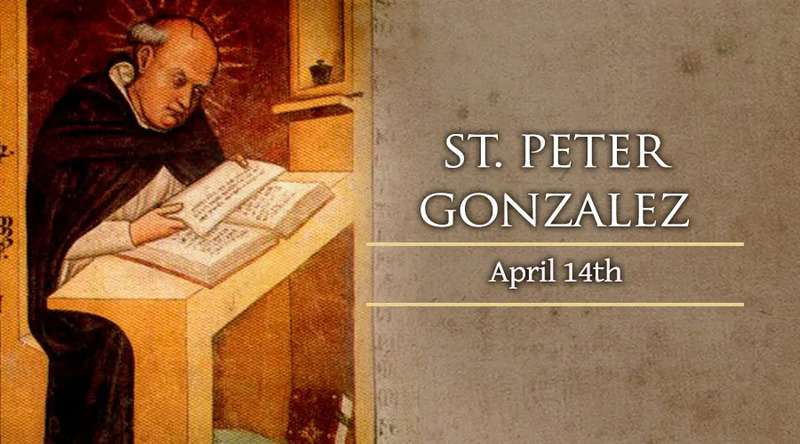 Public humiliation led Peter Gonzalez to a true conversion experience and set him on the road to sainthood. Peter was born into a noble family in Castile, Spain, in 1190, and he became a priest as a step to high office. One Christmas Day, during a grand entrance into the city before all the townspeople, the young priest was thrown off of his horse and onto a dung-heap. Embarrassed and knowing that his parishioners thought he was a fake, Peter withdrew from the world for a period of prayer and meditation. During this time, he had a conversion and spent the rest of his life making up for his lost youth. He joined the Dominicans and shunned those who tried to convince him to return to his old ways, saying: "If you love me, follow me! If you cannot follow me, forget me!" He served as the confessor and court chaplain to King Saint Ferdinand III of Castile, and reformed court life. He also worked for the crusade against the Moors, went into the battlefields, and worked for humane treatment of Moorish prisoners. Fearing that the honors and easy life offered by the king’s court would lead him to return to his previous ways, he left the court and evangelized to shepherds and sailors. He died in 1246 and was canonized in 1741.